How much would you pay to borrow money? The answer you give is likely to depend on two factors. First, how desperate you are to get your hands on the cash. And, secondly, how much time you're prepared to invest in shopping around for the best rates and then making credit applications. Financial poverty and time poverty are the enemies of smart money management. Way too many Americans are carrying debt on cards that charge rates that are unnecessarily high. While other factors apply, it's fair to say that the better your credit, the better your chances are of paying significantly less for your credit card debt. 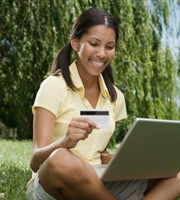 Search the IndexCreditCards.com list of low-interest credit cards, and you should find products offering low rates along a scale: 10.99 percent to 22.99 percent APR is currently a common range. The rate along that spectrum you're offered is going to depend on your credit score (and other factors), so the better your score, the better your chance is for getting a lower rate. It's important to recognize that virtually all cards now charge variable rates, meaning you stand to pay more when wider interest rates rise, though generally only on new transactions. Any existing balance would usually be charged at the rate in force when charges were made. Get approved for Discover it® chrome, and you stand to earn 2 percent cash back on up to $1,000 in combined purchases each quarter at restaurants and gas stations. And you won't need to remember to sign up afresh every three months to get that. Meanwhile, you can earn 1 percent cash back on all your other purchases -- along with some of the most friendly fees going: no annual fee, no overlimit fee, no late fee on your first late payment and no foreign transaction fees. This is ideal if you want to spend as little time as possible thinking about your plastic. If you don't mind jumping through a few more hoops to get your rewards, Discover it® Cash Back (plain, not chrome flavor) has the same rates and potentially richer rewards, including 5 percent cash back on quarterly rotating categories on up to $1,500 in purchases after you sign up. Barclaycard® Ring MasterCard®. This currently charges a very attractive 8 percent variable APR on purchases and balance transfers, and you earn rewards for good performance through the issuer's innovative Giveback program. Traditionally, the best rates are on cards that don't give rewards, though the Barclaycard Ring severely tests that rule. There are, however, some non-rewards products that can beat even that 8 percent APR. These often come with travel and car rental insurance cover, and sometimes other services. Simmons Bank Visa® Platinum. You're likely to struggle to better this one's ultra-low 7.25 percent variable standard purchase APR. This card also carries no annual fee. Iberiabank Visa® Select. This card's low ongoing variable rate APR starts at 7.50 percent, but also offers 9.50 percent or 11.50, depending on creditworthiness. Pretty much all low-interest cards require you to have an excellent credit score, which is often defined at 720 or above on FICO's scale but it's important to remember that other agencies may use a different scale to define "excellent." It's also important to keep in mind that credit card companies look at other factors in addition to your credit score to determine creditworthiness. If it's desperation that's holding you back from getting a better deal, this probably isn't a solution for you. But if it's a lack of time holding you back, you really might want to consider setting aside just 30 minutes or so to check the IndexCreditCards.com lists, and find and apply for something cheaper than your current plastic. Your savings could be significant. 0 Responses to "Our pick of the best low-APR credit cards"